Destructive chewing is one of the most common complaints among dog owners. It can be a frustrating problem - and an expensive one. Chewing is not bad. It is a normal and necessary activity for a dog. Chewing only becomes a problem when your dog chews things you don't want him to chew. This information is designed to help you understand why your dog is being destructive and to offer you some avenues toward a solution. 1. Your Dog Did Not Eat the Couch Because He’s Mad at You! Boredom - One of the ways dogs relieve boredom is by chewing. They will chew whatever is available to them or what they enjoy most. Think of how much fun it must be to rip the stuffing out of a couch and watch it fly all over the living room! Tension - Dogs, unlike people, don't keep tension bottled up. They release it, usually by chewing. If departure upsets your dog, for instance, he may chew the kitchen table leg to relieve his anxiety. Lack of Exercise - All dogs need exercise and some need more than others. 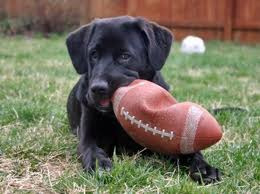 If your dog does not get enough exercise, he may use chewing as an outlet for his pent-up energy. Poor Diet or Hunger Tension - Dogs not getting proper nutrition or who are sensitive to food additives may exhibit any number of behavior problems, like chewing. Teething - When puppies lose their milk teeth (baby teeth), they need to chew on things much the way human babies do when they cut teeth. After the adult teeth are all in, when your pup is about 6 months old, they will begin to set in the jaw. At this time, puppies need to chew more than ever. If your puppy is between 6-10 months old and is left in an empty room, he will chew the walls and floor because he has to chew. If your dog has many chew toys on the floor it will be harder for him to differentiate between what's his and what's yours. It all looks like fair game to him. If, however, he has just one or two toys, it is much easier to teach him the difference. When he is better trained you may wish to add a couple more. It is also a good idea to reserve one favorite toy that your dog only gets when you are gone. It will become a special treat that will occupy more of his time than his ordinary, everyday toys. Dogs don't have morals and don't know right from wrong. When your dog looks "guilty" he is actually saying, in dog language, that he is submissive and/or scared. He is in effect saying, "I respect you and don't want you to hurt me." Let's consider what leads up to that guilty look: You leave for work and for some reason, perhaps boredom, your dog begins to chew a shoe you forgot to put away. It feels good on his gums and the leather tastes especially nice. He flips it in the air a few times for laughs. Eventually, he loses interest and takes a nap. A few hours later you come home. 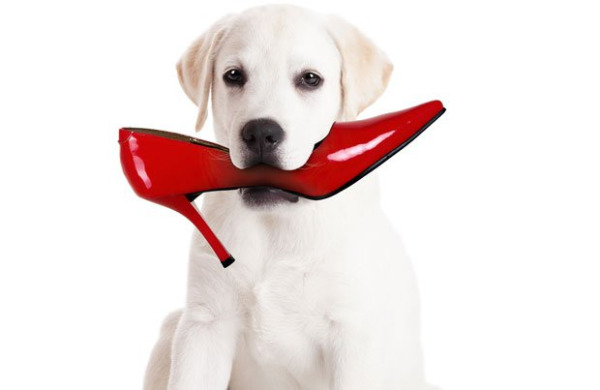 Your dog is happy to see you and you him - until you find the rest of what used to be your shoe. So you yell and maybe even hit him as you show him the chewed shoe. On another day you leave for work and your dog discovers how fun it is to rip the stuffing out of the couch cushions. He has a real blast scattering that puffy white stuff all over the living room. Some time later you arrive home to find this mess and again let your dog know how unhappy you are. Notice a pattern? Your dog has. He knows that he has a great time when he chews up your things and that he has a really bad time when you come home. Your dog has not learned that chewing is bad. He has fun when he chews. What he has learned is that your homecoming is very unpleasant. So now after a great day's chewing, when he hears you drive into the driveway, he gets scared and submissive and looks "guilty.” He reacts this way because he knows he's in for it when you walk in the door, not because he knows he has done something wrong. To teach your dog not to chew something, you need to catch him in the act or before. When he so much as looks at your shoe or the couch or whatever, utter a sharp, bark-like sound and/or clap your hands to startle your dog and interrupt his actions. Then give him something else to do like chew on his own toy, come to you, or sit on command. Punishing him after the fact will do nothing more than confuse him and damage your relationship with him. When you are away from home or are too busy to watch your dog, confine him in a place where he can't get into trouble. For some dogs, this can be a small room. For many, this means a dog crate. When confined, your dog will be safe and will not be able to get into anything he shouldn't. When you confine him, make sure he has fresh water and a safe chew toy. A stuffed kong is great for confinement. When you come home at the end of the day it will be with the comfort of knowing that your house is in one piece and you and your dog will both be happy to see each other. If your dog has already developed a habit of chewing your things, you may need to crate him for a long time before the habit is broken. When you begin to give him more freedom, do so gradually to help prevent setbacks. If you have a puppy, plan to crate him until he is at least one year old to get through the worst of the teething periods. It will also be helpful to your dog if you make your departure and homecoming low-key and uneventful. If you get your dog excited just before you leave, he will be more anxious about your going. The same holds true for your return. If your greeting is a very excited one, your dog will begin to get revved up around the time you usually get home. If you are late, your dog will need to do something to relieve his anxiety and pent-up energy. He will chew. Similarly, if you always feed your dog or take him out to relieve himself immediately upon arriving home, your dog will learn to get excited around the time you are due back. Get your dog used to the pattern that your homecoming means a quiet "hello" and a pat on the head, and that going out and eating have no connection with your return. Let your dog out 10-15 minutes after you arrive (with the exception of a young pup who has been confined for an extended period of time) and feed him 30 minutes to an hour after that. Give your dog lots of physical and mental exercise to provide him with constructive ways to release his energy. Along with 1-2 hours of physical exercise a day; give your dog a mental workout in the form of training. Training gives your dog a job to do and you will strengthen your relationship with him by establishing clear (and fun) communication. Feed your dog a high quality, naturally formulated dog food to ensure that your dog is not being destructive because of a nutritional imbalance or sensitivity to additives in his diet. Feed adult dogs twice a day and young puppies 3-4 times. Give your dog every chance to behave his very best. Daycare may be another good option for your dog. At a good daycare they will be active for part of the day and have nap breaks in between their play sessions. If you cannot afford daycare every day even a day or two a week can make a big difference. Note: Gemini Dogs Doggie Daycare is open every day of the year from 6:00am to 10:00pm, and pricing can be as low as $20 per day with a package plan. By trying to understand your dog and his behavior and by following a common sense approach, you'll be well on your way to having a dog that is a joy to live with, a couch (and carpet and walls and shoes) that is intact, and a lifetime of friendship with your dog.